ORLANDO, Fla., Feb. 8, 2019 /PRNewswire/ -- Leading appliances manufacturer Midea is celebrating the launch of two new products from its FlashChef™ professional kitchen series, a high-speed oven and a Scan&Go™ microwave, at the 2019 North American Association of Food Equipment Manufacturers show (NAFEM 2019). Midea is showcasing these new products along with its other products at booth # 539 in the Orange County Convention Center. "We're thrilled to premiere these latest additions to our industry-leading FlashChef™ series of products at NAFEM 2019," said Gino Iacovella, New Business Development Director of Midea. "We're confident that the oven and microwave will, like all Midea products, meet the high expectations of convenience stores, coffee shops, chain stores and commercial kitchens with their ultra-efficient performance, effortless operation and impressive durability." The FlashChef™ high-speed oven offers incredible cooking performance as well as a stylish, space-friendly design with largest touch screen in its class. The oven features dual impingement for fast browning and crisping on both sides of the food, saves heating time with the dual magnetron and consistent power output and makes cleaning easy with press n' eject air filters and a stainless-steel finish. It's the first High Speed Oven of its class that delivers more uniform heating with inverter technology. The Scan&Go™ microwave is the first commercial microwave from Midea that comes with a built-in scanner to enable User-Friendly operation by scanning the barcode on food packaging to set cooking time and power levels. Cooking requirements for different products can be programmed on a computer to generate a QR code that the microwave will use to set the cooking program automatically upon placing the product inside. The model features 11 power levels, three cooking stages, 100 auto programs and up to an hour of cooking time to cover most recipes. The FlashChef™ is an exclusive lineup of commercial cooking appliances that are designed to meet the markets' ever-growing demand for efficient, durable and user friendly professional kitchen standards. "With Midea's strong research and development capabilities, our new products always win customers' approval soon after they are launched. 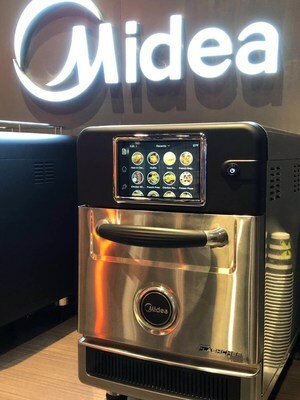 Midea is already working with large enterprises and retail stores worldwide to help commercial food and beverage business owners achieve maximum efficiency," said Gino. Midea's Commercial Cooking Appliances Division is affiliated with the Midea Group, one of the largest appliance manufacturers. Founded in 1968, Midea is the world's No.1 major appliance manufacturer according to Euromonitor and ranks No.1 in microwave ovens. It operates three production bases and two R&D centers in China, one production base in Belarus and three R&D centers in Bologna, Italy and Louisville, Kentucky, USA.